Simon and Dean manufacture tote pans in all shapes, sizes and variations, including galvanised steel tote pans and baskets, tote pan racks, workstands and feeder racks, pallet and cantilever racks and trolleys. This standard, universal stacking Tote Pan is strongly constructed from galvanised steel with reinforced rims, easy grip handles and a cardholder at each end. A complete, inexpensive system widely used for the handling and storage of components. As optional extras, these galvanised steel storage boxes can have coloured ends, be embossed with the company name and can come with dividers, individual part pans, slide-on lids and perforated bases. These steel Tote Pans are a robust alternative to plastic Euro Pans and Euro Containers and are widely used for component storage. Made in 25mm or 12mm square wire mesh, they can be zinc plated or white plastic coated and will interstack with Tote Pans and fit racking. Standard racking for the workplace and storeroom, available in a variety of colours, pans are individually located on three or four wide horizontal shelves (the industry standard), or tilted shelves (to allow viewing of contents). Suitable for press operators and assembly areas, these are either 2 or 4 high tote pan stands, with horizontal or tilted shelves and are available in a variety of colours. Interstacking two or three shelf units designed for flexibility or to increase height in available storage areas. Available as horizontal or tilted shelf, in a variety of colours. Line-side live storage with rear loading shelves, tilted for picking of contents and with a bottom horizontal return shelf for empty pans. Fitted with a fork truck reinforced base to allow loaded racks to be moved or replaced. Available in a variety of colours. Palletise tote pans in pallet racking. Tote pans are individually located on angle guide rails, designed to stack up to 4 high, capacity 500kg per pallet. Available in a variety of colours. Use as a stores counter or workbench for general purpose parts storage with galvanised steel worktops. Tote pans or vista bins individually located on guide rails. For display and storage areas. Available in a variety of colours, with horizontal or tilted shelving. Stackable high density drawer units for the most space-saving storage method of steel or plastic tote pans. With drawer guides and safety stops to retain pans when accessing contents, available in a variety of colours. For lifting, moving and placing loaded stacks o0f standard Tote Pans. Compact, mobile storage for parts and equipment. 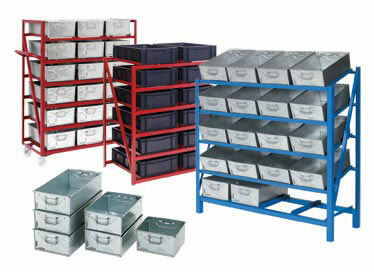 Under worktop rack trolleys can also be supplied with recessed galvanised steel workshop trays. Available in a variety of colours. Pans located on tilted shelves for easy selection of components. Available in a variety of colours. You can place an ONLINE ORDER using our e-commerce website by clicking here, or if you have a copy of our current catalogue and price list, you can phone, fax or email an order to us.